Bournemouth midfielder Shaun MacDonald hopes he can use the club's League Cup run to press a claim for more regular Premier League appearances. Wales international MacDonald, 27, has been named as a substitute in the top flight just once this season. MacDonald's only other appearance came against Hartlepool in a League Cup second round tie. "You have to keep working hard to make sure you're ready when the opportunity comes," he told BBC Radio Solent. 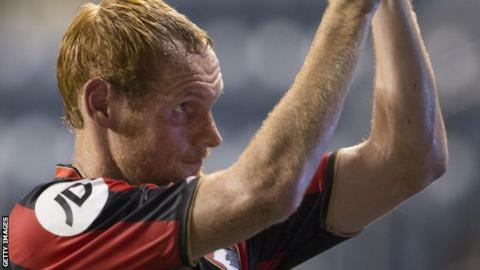 Bournemouth travel to Preston in the League Cup third round with MacDonald, who joined the Cherries from Swansea City in August 2011, set to be involved. Despite his chances being limited in Eddie Howe's squad, he has been part of Chris Coleman's Wales party as his country close in on qualification for Euro 2016. "Hopefully I get more game time for Bournemouth and get the chance to keep my place in the Wales squad," MacDonald added. "As a footballer, I have to keep pushing forward with goals to aim for, otherwise you end up going backwards. Euro 2016 is certainly something to look towards."